Aim: The present study was aimed at evaluating the use of enamel matrix derivative (Emdogain®) protein for periodontal regeneration in the treatment of deep intra bony osseous defects. 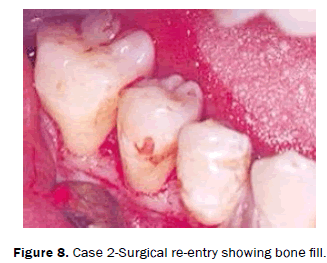 Patients with systemic involvement, furcation involvement, one and two walled defect and defect involving the anterior teeth were excluded in this present study to find out the exact effectiveness of the material. Material & Methods: A total of ten patients (6 males and 4 female) in the age group between 20 to 30 years, who has osseous defects measuring Probing Pocket Depth (PPD) ≥ 8 mm; Clinical Attachment Level (CAL) ≥ 9 mm and intrabony defect depth ≥ 5 mm were included in the study. These patients were treated for adult periodontitis with Emdogain®. Prior to surgery the indices for oral hygiene and soft tissues assessment were also recorded. Statistical analysis: Paired t-test for individual samples was used for statistical analysis. If the probability value (P) was less than 0.05, it was considered significant. Results: After a one year study, surgical re-entry was made and the Data from this study demonstrated that application of (EMD) Emdogain gel resulted in a statistically significant, increase in root coverage, gain in the clinical attachment level (CAL), and probing pocket depth (PPD) reduction. Conclusion: The current findings confirm the previous reports and document that pocket closure and healthy periodontal conditions were obtained by this Emdogain therapy. Regeneration, Intra bony defects, Enamel matrix Protein. The present study was aimed at evaluating the use of Enamel Matrix derivative (EMDOGAIN®) proteins for periodontal regeneration in the treatment of periodontal deep intrabony Osseous defects as measured by changes in the reduction in the pocket depth and increase in the clinical attachment level and hard tissue defect fill. The goal of regenerative periodontal therapy is the reconstitution of the lost periodontal structures due to periodontal disease or trauma . Therapeutic approach has been demonstrate to promote periodontal regeneration, by an enamel matrix protein derivative (EMD), consisting of a formulation of amelogenin proteins from developing porcine enamel. The clinical use of an enamel matrix derivative (EMD) has been successfully proved in periodontal surgery, as promoting regeneration of periodontal tissues including new cemented, periodontal ligament (PDL) and alveolar bone . Auto radiographic and scanning electron microscopy studies provide additional evidence that, following apoptosis of her twig’s epithelial root sheath (HERS) cells and deposition of the enamel matrix proteins onto the dentin surface, the cement genesis process is initiated and kept modulated by these proteins [3-5]. Subsequently, when cemented has been laid down onto the enamel-matrix-covered dentin surface, an attachment apparatus will develop. Thus the enamel matrix protein plays a vital role in the development of periodontal apparatus. Although the effect of EDTA provides little additional periodontal regeneration, having EMD properly adsorbed to root surfaces has much larger implications. The impact of having blood and EMD compete during adsorption of root surfaces reduced PDL cell attachment by up to 25% and proliferation by 30% . EMD has been shown to enhance the oestrogenic potential of bone marrow by increasing the total number of stromal cells, [7-9] enhancing the proliferation of osteoblasts, [10–15] promoting cell differentiation, [10,16–19] and stimulating migration and viability of osteoblasts  which can lead to improved bone regeneration. A commercial enamel matrix derivative, Emdogain® (Biora AB, Malmö, Sweden) received FDA approval and is now available for the treatment of periodontal defects (Figure 1). 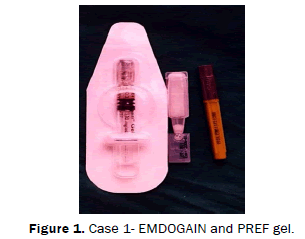 Figure 1: Case 1- EMDOGAIN and PREF gel. It is a purified acidic extract of developing embryonical enamel derived from six-month-old piglets. Its purpose is to act as a tissue-healing modulator that would mimic the events that occur during root development and to help stimulate periodontal regeneration [20,21]. Three matrix proteins, corresponding to amelogenin,  enamel in,  and Sheathing (also called Ameloblastin or Amelin),  and 2 enzymes, corresponding to MMP [20-25] and EMSP126 have been purified and the cDNA cloned from developing porcine teeth . These proteins are all present in EMD. The enamel matrix is composed of a number of proteins, 90 percent of which are amelogenins. Such proteins are thought to induce the formation of the periodontal attachment during tooth formation . The present study was aimed at evaluating the use of Enamel Matrix derivative (EMDOGAIN®) proteins for periodontal regeneration in the treatment of periodontal deep intrabony Osseous defects as measured by changes in the clinical attachment level and hard tissue defect fill. Ten patients (6 males and 4 females) who were systemically healthy with-in the age group between 20-30 years were selected for the treatment of regenerative periodontal surgery. Institutional ethical committee clearance was obtained. Informed consent was obtained from all the patients who were included in this study. PHASE I therapy includes of oral hygiene maintained instructions, scaling, and root planning, professional polishing with the use of rubber cup and a low abrasive polishing paste( Clean joy, voco). Coronoplasty was done if required. Plaque control instructions were repeated until patients achieved a plaque score of equal to or less than one. The patient’s plaque control and tissue response was revaluated 4 weeks later. Occlusal stents were fabricated using clear auto polymerizing acrylic resin. These Custom-made occlusal acrylic stents were used to standardize the probe angulations and position. The occlusal stents were made in such a way that they cover the occlusal surface of the teeth being treated so as to cover the coronal one third of the teeth segment. The soft tissue and hard tissue measurements were recorded at the baseline. Pre-operative radiographs were taken using paralleling cone technique to avoid any elongation (Figure 2). 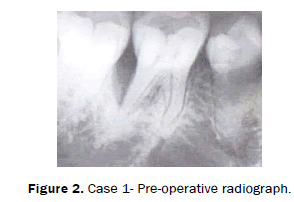 Figure 2: Case 1- Pre-operative radiograph. The Inclusion criteria was followed in selecting the parameters of the patients with probing pocket depth (PPD) with more than or equal to 8 mm. The clinical attachment level (CAL) which was more than or equal to 9 mm and the intra bony defect (3 wall) depth (DD) which should be more than or equal to 5 mm was considered for a detailed study. These clinical parameters were recorded only on the teeth to be treated at baseline, and 3 and 6 months after surgery. The patients with the systemic involvement, furcation involvement, one and two wall defect and these anterior teeth were not considered for the study due to the variance in the results. The soft tissue and hard tissue measurements were recorded at the baseline and after one year by using an occlusal stent which is made prior to the surgery to observe the changes that takes place within this study period. After one year by using an occlusal stent which is made prior to the surgery to observe the changes that takes place within this study period. The assessments were made using the occlusal stent are, Height of the Gingival margin (HGM), clinical attachment level (CAL), Cristal height of the alveolar bone (CHAB) and the Bone Loss (BL). The probing pocket depth and the depth of The Defect were recorded without using the occlusal stent (Figure 3). Figure 3: Case 1- Baseline intra bony defect. Once local anesthesia was administered (2% Lidocaine, epinephrine 1:100,000), periodontal flap was raised by using a horizontal crevicular incision. All the granulation tissue and tissue tags were removed, exposing the underlying bone, and the exposed root surfaces was carefully planned with curettes and ultrasonic scaling. The bleeding should be effectively controlled within the defect. Demineralization of the root surface was done by using 24% ethylene diamine tetra aceticacid(EDTA) (Pref gel®) for 15 seconds . This removes the smear layer and facilitates adherence of the Emdogain®. Then the wound is rinsed with saline and the Emdogain® gel is applied over the exposed root surface (Figure 4). 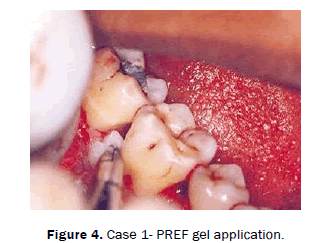 Figure 4: Case 1- PREF gel application. Contamination with blood or saliva should be avoided. Then the flap is closed with interdental sling suture. Suturing was done with non-absorbable silk suture (Figure 5). Although placement of the dressing was depending upon the patients acceptance level. Figure 5: Case 1- Emdogain® gel application. Systemic antibiotic coverage for 10 to 21 days (doxycycline, 100 mg daily) and a non-steroidal anti-inflammatory (Ibuprofen+Paracetamol, t.d.s. for 5 days) were prescribed. Patients were instructed not to brush the teeth in the treated area. All patients were placed on 0.2% chlorhexidine gluconate (Hexidine, ICPA, and India) twice daily, for 1 minute, for4–6 weeks. They were instructed not to disturb the pack, if placed and to avoid trauma to the treated site. One week following surgery, periodontal pack was removed. Sutures were removed. The patients were followed up at regular intervals of 3, 6 and 9 months respectively. The surgical site was not examined during the study period to favour healing. One year later, the patients were recalled and postoperative radiographs were taken in the surgical site (Figure 6), to compare with the baseline radiograph. Then the surgical reentry was done to confirm the radiographic finding by using the occlusal stent made before the surgeries to evaluate the amount of bone fill in the defect (Figure 7). Then post-operative and pre-operative clinical measurements records were compared with the base line (Figure 8). 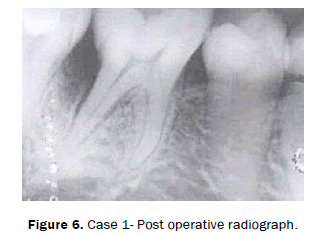 Figure 6:Case 1- Post operative radiograph. 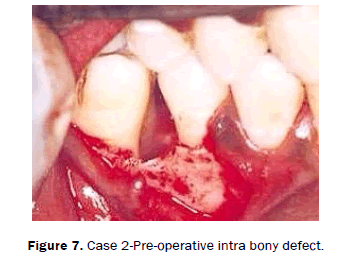 Figure 7: Case 2-Pre-operative intra bony defect. Figure 8: Case 2-Surgical re-entry showing bone fill. The results were evaluated by using paired “t” test for the independent samples. The mean and standard deviation of the soft tissue and hard tissue measurements between the base line and the one year period in the sites treated with Emdogain® were made and the P value was derived by using the above mentioned paired t-tests. Ten systemically healthy patients, 6 males and 4 females within the age group between 20-30 years were treated for generalized chronic periodontitis by reconstructive periodontal surgery using EMD. Pre-surgical and post-surgical records were made using the occlusal stents to standardize the readings there by reducing the bias. During the period of the study, wound healing was uneventful. The periodontal dressing and the sutures remained in place until the first post-operative appointment. There were no post-operative complications reported by any patient. The complete test group turned up till the termination of the study. The results can be summarized as follows: The meta-analysis of intra bony defects treated with EMD resulted increased height of gingival margin (HGM) from 7.50 ± 0.05 mm to 8.00 ± 0.05 mm (p=0.068). The mean clinical attachment loss [CAL] reduced from 15.62 ± 0.05 mm to 12.50 ± 0.05 mm (p=0.001). The mean PPD showed marked reduction from 8.25 ± 0.05 mm to 4.31±0.05 mm (P=0.001). The crystal bone height (CHAB) showed no changes between baseline and post-operative 11.25 ± 0.05 mm (p=1.00). The mean bone loss (BL) reduced from 19.00 mm to 13.375 mm (p=0.001).The defect depth (DD) also showed marked reduction in EMD treated site from 7.00 mm to 2.125 mm (p=0.012) (Tables 1-6). The test group displayed a significant reduction in plaque accumulation and so the gingival inflammation from baseline to one year. There was significant reduction in sulcular bleeding in the test group from baseline to one year (Graph 1). Table 1: Mean and standard deviation of the height of gingival margin (hgm), pre operatively and post operatively for emdogain treated sites. Table 2: Mean and standard deviation of the clinical attachment level (cal), pre operatively and post operatively for emdogain treated sites. Table 3: Mean and standard deviation of the probing pocket depth (ppd), pre operatively and post operatively for emdogain treated sites. Table 4: Mean and standard deviation of the crestal height of alveolar bone (chab), pre operatively and post operatively for emdogain treated sites. Table 5: mean and standard deviation of the bone loss (bl), pre operatively and post operatively for emdogain treated sites. Table 6: Mean and standard deviation of the defect depth (dd), pre operatively and post operatively for emdogain treated sites. Graph 1: Graphical representation of the results. Careful patient selection and surgical technique as well as meticulous post-operative plaque control are more important for the outcome of the therapy than the routine administration of the antibiotics. However it should be emphasized that following treatment with Emdogain® no complications such as exposure of the membrane or of the graft material can occur and consequently the possibility of the post-operative infection is lower than after GTR or bone grafting procedure . Some studies  have shown intrabony defects treated with open flap debridement with enamel matrix proteins showed significantly more PPD reduction when compared to patients treated with only open flap debridement. Similarly few studies have showed no advantage by using Emdogain® over placebo . Due to the higher predictability with enamel matrix proteins and to the severity of the cases, no controls were included in this study. The favourable results obtained in the present clinical trial underlines the therapeutic prospects in regenerative periodontal therapy for Emdogain® but the predictability in achieving regeneration has not been solidly established due to a limited number of cases reported and a short duration of study. Thus within the limits of the current study it can be concluded that the present results do support the use of Emdogain® in the treatment of deep intra bony defects and enamel matrix protein may improve the outcome of treatment of deep intra bony defects in patients with optimal plaque control. The most reliable outcome variable for assessing for periodontal regeneration is human histology. Due to ethical considerations and patient management limitations, no histologic evidence was obtained to establish whether healing took place by repair or by new connective tissue attachment however studies involving more defects including a longer follow up periods and histological evaluations following healing are required to further ascertain the efficacy of Emdogain® in promoting regeneration of periodontal tissues. However, the effects of Emdogain® on malignant oral cells are not well understood. Emdogain® seems to have broad regulatory effects on malignant cells and on several carcinoma-related factors. Evidence suggests that patients with premalignant or malignant mucosal lesions should not be treated with Emdogain®. The present study comprised of regenerative treatment using Emdogain® at sites with deep angular bony defects, resulted in a mean clinical attachment gain of 3.1 mm, a residual pocket depth of 3.9 mm and a bone-fill of 4.8 mm. The current findings confirm the previous reports and document that pocket closure and healthy periodontal conditions were obtained by this therapy. The present clinical trial with Emdogain® showed similar clinical results to guided tissue regeneration, but it is simpler to use and determines less post-operative complication. Thus it can be effectively used in our day to day clinical practice for different regenerative procedures even by a less skilled hand in a more effective manner. Stefan-Ioan S, et al. The Use of An Enamel Matrix Protein derivatative (Emdogain®) In Regenerative Periodontal Therapy Which Applications Are Evidence-Based? Results from Human HistologicalStudies. TMJ. 2008;58:108-110. Sculean A, et al. Enamel Matrix Proteins and Periodontal Wound Healing and Regeneration. ClinAdv Periodontics.2011;1:101-117. Lindskog S. Formation of intermediate cementum. II: A scanning electron microscopic study of the epithelial root sheath of Hertwig in monkeys. J Craniofac Genet Dev Biol. 1982;2:161–169. Lindskog S and Hammarström L. Formation of intermediate cementum. III: 3H-tryptophan and 3H-proline uptake into the epithelial root sheath of Hertwig in vitro. J Craniofac Genet DevBiol.1982;2:171-177. Slavkin HC, et al. Hertwig’s epithelial root sheath differentiation and initial cementum and bone formation during long-term organ culture of mouse mandibular first molars using serumless, chemically-defined medium. J Periodontal Res. 1989;24:28–40. Miron RJ, et al. Enamel matrix protein adsorption to root surfaces in the presence or absence of human blood. J Periodontol. 2012;83:885-892. Keila S, et al. In vitro effects of enamel matrix proteins on rat bonemarrowcells and gingival fibroblasts. J Dent Res. 2004;83:134–138. Song ZC, et al. Effect of EMPs on growth and attachment of human BMSCs. Shanghai J Stomatol.2006;15:601–604. Guida L, et al. In vitro biologic response of human bonemarrow stromal cells to enamel matrix derivative. J Periodontol.2007;78:2190-2196. Schwartz Z, et al.Porcine fetalenamel matrix derivative stimulates proliferation but not differentiation of pre-osteoblastic 219 cells, inhibits proliferationand stimulates differentiation of osteoblast-like MG63cells, and increases proliferation and differentiation of normalhuman osteoblast NHOst cells.J Periodontol. 2000;71:1287-1296. Satoshi Y, et al.The effects of enamelmatrix derivative (EMD) on osteoblastic cells in culture andbone regeneration in a rat skull defect. J Periodontal Research. 2003;38:333–342. Carinci F, et al.Effects of Emdogainonosteoblast gene expression. Oral Diseases. 2006;12:329–342. Pischon N, et al. Effects of an enamel matrix derivative on humanosteoblasts and PDL cells grown in organoid cultures. Oral Surg Oral Med Oral Pathol Oral RadiolEndod. 2006;102:551–557. Johnson DL, et al.Cellular effects of enamel matrix derivative are associatedwith different molecular weight fractions following separationby size-exclusion chromatography. J Periodontol. 2009;80:648–656. Qu Z, et al. Effect of Emdogain onproliferation and migration of different periodontal tissueassociatedcells.Oral Surg Oral Med Oral Pathol Oral RadiolEndod. 2010;109:924–931. Ohyama M, et al.Effect of enamel matrix derivative on the differentiation of C2C12 cells. J Periodontol.2002;73:543–550. Takayama T, et al.Enamel matrix derivative stimulates core binding factor α1 /Runt-related transcription factor-2 expression via activation of Smad1 in C2C12 cells.J Periodontol.2005;76:244-249. Hattar S, et al. Potential of biomimetic surfaces to promote in vitro osteoblast-like cell differentiation. Biomaterials. 2005;26:839–848. Van den DolderJ et al. The effect of Emdogain® on the growth and differentiation of rat bone marrow cells. J Periodontal Research. 2006;41:471–476. Hammarstrom L.Enamel matrix, cementum development and regeneration. J ClinPeriodontol.1997;24:658–668. Heijl L, et al. Enamel matrix derivative (Emdogain) in the treatment of intrabony periodontal defects. J ClinPeriodontol.1997;24:705-714. Hu CC, et al. Cloning, DNA sequence, and alternative splicing of opossum amelogenin mRNAs. J Dent Res. 1996;75:1728-1734. Hu CC, et al. Sheathlin: cloning, cDNA/polypeptide sequences, and immune localization of porcine enamel sheath proteins. J Dent Res. 1997;76:648–657. Fukae M, et al. Enamelysin (matrix metalloproteinase-20): localization in the developing tooth and effects of pH and calcium on amelogenin hydrolysis. J Dent Res. 1998:77:1580–1588. Simmer JP, et al. Purification, characterization, and cloning of enamel matrix serine proteinase 1. J Dent Res. 1998;77:377–386. SculeanA, et al. Clinical and Histologic Evaluation of Human Intrabony Defects Treated with an Enamel Matrix Protein Derivative (Emdogain) protein.Int J Periodontics Restorative Dent. 2000;20:375-381. Sculean A, et al. The effect of post-surgical antibiotics on the healing of intra bony defects following treatment with enamel matrix protein. J periodontal. 2001;72;190-195. Chambrone D, et al. Treatment of infrabony defects with or without enamel matrix proteins: a 24-month follow-up randomized pilot study. Quintessence Int. 2010;41:125-134. Grusovin MG and Esposito M. The efficacy of enamel matrix derivative (Emdogain) for the treatment of deep infrabony periodontal defects: a placebo-controlled randomised clinical trial. Eur J Oral Implantol. 2009;2:43-54. Laaksonen M, et al. Emdogain in carcinogenesis: a systematic review of in vitro studies. J Oral Sci. 2010;52:1-11.